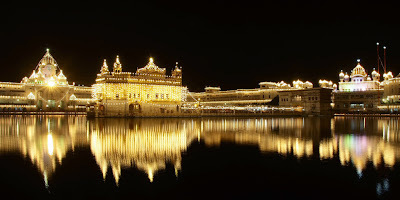 I have seen reports that on President Obama's upcoming trip to India he may avoid going to the Golden Temple in Amristar because some back home may perceive he is a closet Muslim. Correspondents say that it had earlier been strongly hinted that Mr Obama would visit, and it appears the White House has not done its homework on the Golden Temple and the requirements and sensitivities associated with entering it. Officials at the temple said that although heads needed to be covered, a simple cap for Mr Obama would suffice. Hansdeep Singh, a senior staff attorney for the United Sikhs lobby group, said: "If these rumours are true, this is a tremendously disappointing moment for the entire Sikh community and religious minorities in general." One Indian foreign ministry official told Agence France-Presse news agency an advance team of US diplomats had prepared the temple visit. "We provided them with all the support and guidance they needed but now it is for US officials to decide whether Obama should go to the temple or not," the official said. Mr Obama is a Christian, but a Pew Research survey of 3,003 Americans in August showed that 18% believed the president was a Muslim. The poll found beliefs about the president's faith were closely linked to political judgements about him. It found that people who believed Mr Obama was a Muslim "overwhelmingly disapproved" of his job performance. The United Sikhs group said that if Mr Obama did not visit it would be "a missed opportunity". I believe Obama should go for a couple reasons. One reason being that those who would use his attendance at a Sikh holy site to try and prove he is a Muslim would only prove their ignorance and hatred, and any attack on the president would fail (that is if the president immediately pushes back against any propaganda). The second reason is that as the article states, a certain percentage of Americans believe the president was a Muslim and that the poll also found that those who believe he was a Muslim "overwhelmingly disapproved" of his job performance. Those numbers from the Pew Research survey seem to coincide with a previous poll conducted by CBS News that states eighteen percent of Americans identify themselves as tea party supporters. Considering the results of the two surveys, it would be pointless for Obama to try to woo the Obama-is-a-Muslim believers by not going to a Sikh temple because these individuals already believe the Christian Obama is some sort of crypto-Muslim! These are the people who believe he bowed to foreign heads of state (and the mayor of Tampa) to demonstrate America's subservience. These are the people that believe there is a conspiracy covering up the president's real birthplace. These are the people who believe Sarah Palin is an ethical person. These are the people who the James O'Keefe videos showed the truth, the whole truth, and nothing but the truth. These are the people who follow every chalk scribble Glenn Beck draws out linking the administration to terrorists. Obama by not going to a Sikh trmple prooves he is a MUSLIM because people of all Religion be they Christians, Jews, Buddists, Zorastrains all are allowed ans welcom in any Sikh Temple! But Muslims are the only religion Forbidden by Islamic law from doing so! So see OBAMA IS A MUSLIM indeed! A Sikh Turban can never be worn by a Muslim by Islamic law! The 2 proofs above proove Obama is a Mulsim! I don't really think those are "proofs." I have not entered the temple - does that make me a Muslim? Kevin if you like Obama were to be scared to enter a Sikh Temple buy then turn arround and walk right into a Mosque would all but proove you are a Muslim! Everybody even Athiest can go to Sikh Temples! Only Muslims are permitted in Mosques!